Opening a Crete bank account is simple and very straightforward. If you are planning to be living in Crete, and are buying a property here, then you will need to open a bank account. At the very least, you will need your own account here to receive and deposit monies in connection with the buying process. The Crete banking system offers the majority of services that you would expect from any Bank in Europe, including user friendly cash machines, internet and telephone banking, credit cards, loans and mortgage services. The three of the biggest banks represented on Crete are the National Bank of Greece, Emporiki and ATE. We have found them all to be professional, courteous and with most staff fluent in English, incredibly helpful. 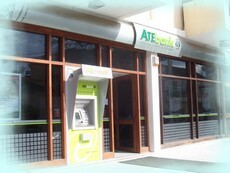 Banking hours are 8.00 am to 2.00 pm Monday to Thursday with an earlier closing time on Fridays of 1.30pm. Closed at weekends of course, but there are plenty of ATMs in the towns and some villages too. You will almost always need your passport when making cash withdrawals in person, and there maybe charges made on cash point withdrawals. Internet banking is in its infancy in Crete, but most will pay your utility bills through a direct debit system. This is very handy if you are away from the Island for long periods and likely to miss a bill. When you get a utility bill you'll get about 2 weeks to pay it. Miss the deadline and a few days later you'll be cut off (not water). Once your bill is paid, you'll be reconnected - no extra charge, though it's probably best to get the bills paid on time if you're going to be away from your property and not living in Crete.